It is impossible to follow the events in Palestine without olives and the olive tree appearing. The olive tree is really an iconic symbol of Palestine and the resistance to Israeli occupation. For years I have seen and heard reference to the olive tree. 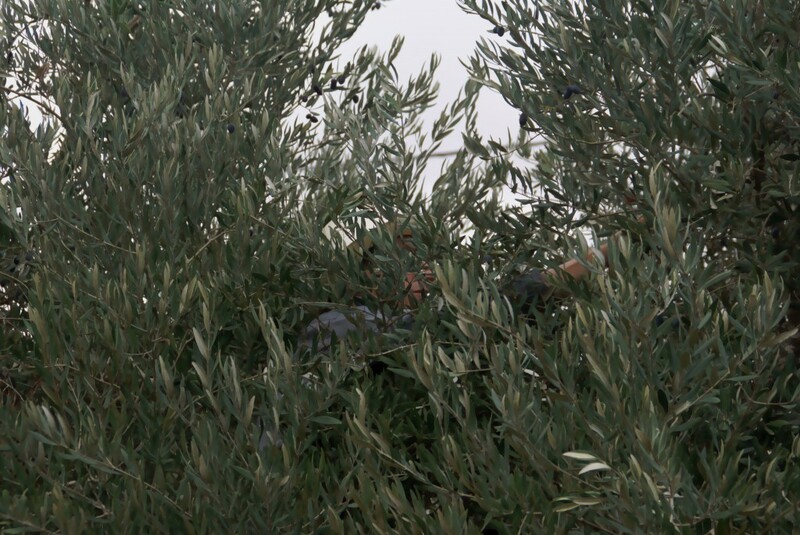 It connects Palestinians to the land and it is often the olive tree that Israelis attack. It is by attacking the olive tree that Israelis attack Palestinians. If Israelis can remove the olive tree from the land; rob it of life, then they can remove Palestinians from the land too; robbing them of one of their lifelines. I will not shy away from saying that I have a romantic notion of the olive tree, it is both mighty and lush; daring and bold. It is a gift from God; revered by one people – despised and envied by another. It is a gift from God nurtured by one people and vandalized by another. I have images of Israeli bulldozers ripping the trees from the earth, their roots hanging in the air and I have images of Palestinians hanging onto the same trees for love of God and fearlessness of life and death. So it is that for the second time I go off to embrace the olive tree. So it is I am returning to participate in the harvest. I am returning to confirm the sense I have of these trees; to ensure I have another chance to participate in their nurturing. So it is that I find myself on a bus with Rabbis for Human Rights headed to an olive grove with about a dozen others. We are off to a farm near the village As-Sawiya, about half way between Nablus and Ramallah. When we arrive, the bus empties. Its occupants, mostly Rabbinical students, mill around the bus waiting for further instructions. Today is the day that Rabbis for Human Rights has designated for bringing Rabbinical students to the heart of Palestine. It is today, as part of a trip guided and sanctioned by Rabbis, that the students feel safe – some perhaps even daring! It is today, that perhaps some of the Rabbinical students will be able to put a human face on the occupation. Perhaps with a human face, some may be able to reject it – the occupation. The bus has been greeted by the son of the local farmer. It is a family farm. The house is on the same piece of land as the trees. This is becoming less common as Israeli settlers move onto the hilltops and the central government builds roads or walls cutting the farmers off from their land. It’s all part of the occupation, disconnect the Palestinian farmers from their land and perhaps they will move away. As-Sawiya is a classic example of Sharon’s edict, only “grab now” has turned into an endless grab while the rest of the world stands idly by wrapped up in the idle “peace process”. outposts. 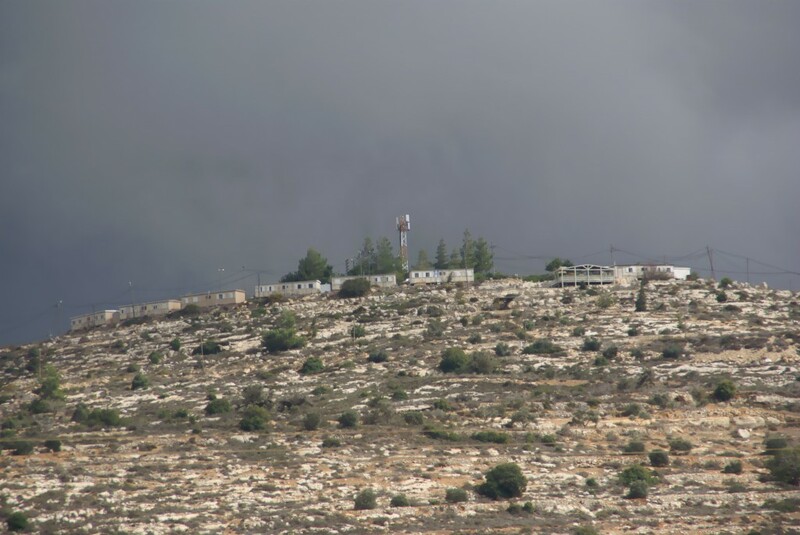 One hilltop resembles an empty trailer park with perhaps 50 trailers but only ten settler families. The strategy? Take over Palestinian land. The attacks on the farmers of As-Sawiya have been numerous and vicious. The attacks include physical assaults on the farmers, trees ripped out of the ground, water pipes cut, schools vandalized and grave stones spray painted. These activities are carried out with the knowledge of the military, who refuse to take any action against the settlers. A google search will bring up plenty of results. But I have digressed. The point today is the olive harvest. We are here on this particular farm to aid in the harvest. We are here to both pick olives and discourage settler interference. I climb up in the trees from the interior and stroke the branches. I pull my hand down the branch and bring the olives from the tree to the ground. It is a wonderful sense to feel the small oval shapes slip from the branch through my fingers. They hit the tarp on the ground with a soft kerplunk, kerplunk, kerplunk. We all work together. There is an Israeli woman near by and I venture to ask her why she has come. “And your conclusion?” I asked. I smile down at her. 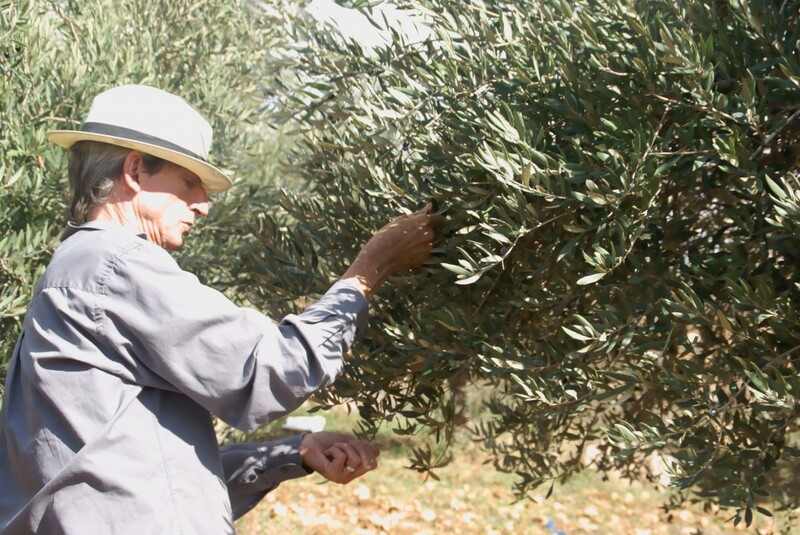 We continue picking olives, Israeli Jew next to Canadian Jew next to American Jew, next British Jew, all next to and with Palestinians.